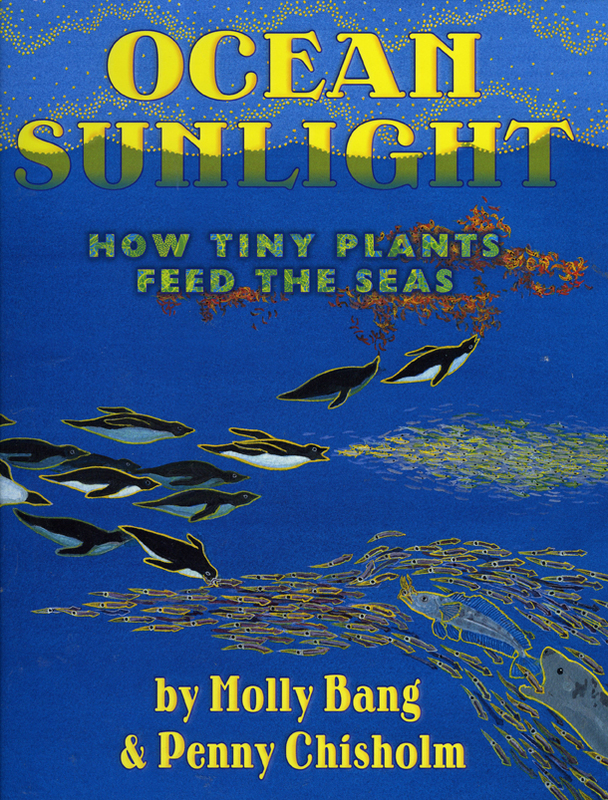 Ocean Sunlight : How Tiny Plants Feed the Seas, by Molly Bang & Penny Chisholm. (Illustrated by Molly Bang.) Blue Sky Press, 2012. Acclaimed Caldecott artist Molly Bang paints a stunning, sweeping view of our ever-changing oceans. In this timely book, Bang uses her signature poetic language and dazzling illustrations to introduce the oceanic world. From tiny aquatic plants to the biggest whale or fish, Bang and Chisholm present a moving, living picture of the miraculous balance sustaining each life cycle and food chain deep within the oceans. The lyrical text provides a clear explanation of the role of the sun in photosynthesis on land and seas as the ocean’s role in the food chain is introduced. Young readers are introduced to "the great invisible pasture of the sea," phytoplankton. Bang uses somewhat complex page designs to deliver considerable information about the way the ocean works, continuously creating a strong sequence of esthetic images. She often uses multiple frames to isolate specific interactions, while retaining an overall sense of unity. Molly Bang is the author-illustrator of more than 30 children's books, including three Caldecott Honor Books: When Sophie Gets Angry—Really, Really Angry..., Ten, Nine, Eight; and The Grey Lady and the Strawberry Snatcher; and The Paper Crane, winner of the Boston Globe-Horn Book Award; Common Ground, which won The Giverny Award for the best children's science book of 2000; and My Light, which was chosen as an ALA Notable and won the Massachusetts Book Award for Children's Literature in 2005. Bang also has won two AAAS/Subaru SB&F Prizes and she has written Picture This, a book for adults showing how picture structure affects our emotions, used by graphics art courses around the world. She holds degrees from Wellesley College, the University of Arizona, and Harvard University and has worked as an educator, an interpreter, and a newspaper reporter. Sallie W. (Penny) Chisholm of Watertown, Massachusetts, is the Lee and Geraldine Martin Professor of Environmental Studies and in the Department of Civil and Environmental Engineering at MIT, where she also has a Joint appointment in Biology. She is a biological oceanographer whose research interests are focused on understanding of the role of microorganisms in shaping marine ecosystems. She is recognized for her work on Prochlorococcus, a marine microbe that is the smallest and most abundant photosynthetic organism on Earth. Chisholm is former director of the MIT/Woods Hole Joint Program in Oceanography, and MITs Earth System Initiative, a multidisciplinary research and education program. She is a member of the National Academy of Sciences and the American Academy of Arts and Sciences, has been a Guggenheim Fellow, and received the Rosensteil Award in Ocean Sciences and the Huntsman Award for Excellence in Marine Sciences. She received a B.A. from Skidmore College and a Ph.D. from S.U.N.Y Albany. A conversation with author Penny Chisholm about her SB&F Prize winning picture book Ocean Sunlight.